The amount of cultural diversity that India has to offer can be seen and experienced nowhere else in the world. Some of the Indian cities boast of several cultural delights for its visitors. For all cultural aficionados, Golden Triangle with Varanasi and Khajuraho tour is a wonderful option by Heritage Hotels of India. This well-planned package of 11 days offer you a chance to explore the wonders of Golden Triangle Cities of Delhi, Agra and Jaipur along with spiritual Varanasi and exotic Khajuraho. 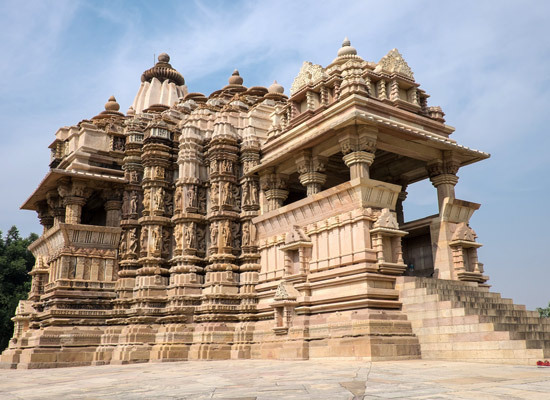 Some of the highlights include exploring mighty forts of Jaipur, boat ride on River Ganges in Varanasi, visiting UNESCO World Sites of Khajuraho temples etc., shopping at the local bazaars and much more. As you reach Delhi Airport / Railway Station, meet our tour representative who helps you with an assisted transfer to the hotel. Complete the check-in formalities. The rest of the day is at leisure. The national capital Delhi is an amalgam of old-world charm of narrow streets and new-age delights of newly built structures. The place is quite popular for offering mouth-watering street food and colorful bustling markets. You can explore the place on your own and indulge in the activities of your interest. After breakfast, get ready for city tour of Delhi, including popular attractions of Old and New Delhi. Start the tour by visiting Raj Ghat - the memorial of Mahatma Gandhi made on the banks of River Yamuna, and Jama Masjid- one of the largest mosques in India, which is made up of marble and red sandstone. After lunch, continue sightseeing, including the World Heritage Sites of Humayun's Tomb - the tomb of the Mughal Emperor Humayun and Qutub Minar Complex - 73 m high tower built by Qutub-ud-Din Aibak in the year 1193. 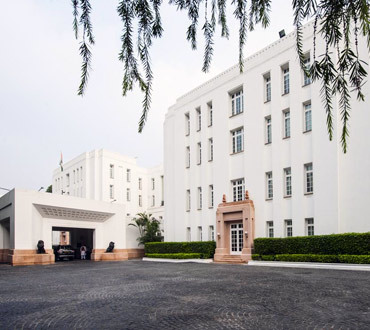 Later on, drive past important buildings including the Parliament house, President's residence and the Diplomatic enclaves. 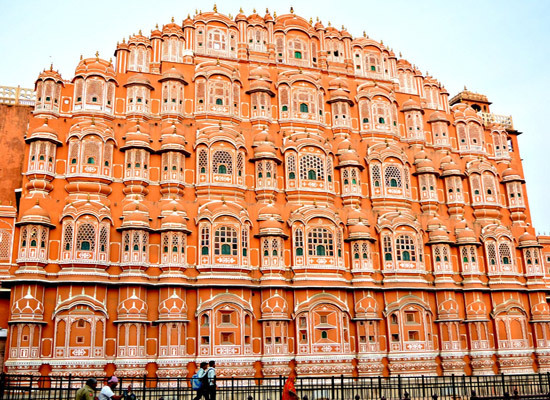 In the morning, after breakfast, start your road journey to the Pink City Jaipur, the capital of Rajasthan state. On reaching, check-into the hotel. The rest of the day is at leisure, and you can spend it as per your liking. You can either relax in your room or can explore the nearby surroundings. 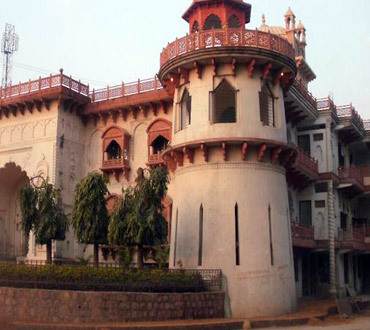 This vibrant city is dotted with various Rajputana architectural marvels. The local bazaars of Jaipur are replete with amazing souvenirs including traditional clothes, traditional fabrics, semi-precious jewelry, precious stones, and various other handicrafts. You can also relish sumptuous local sweet and savory delights. 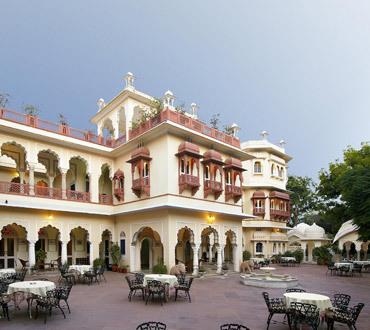 On day 4, after savoring breakfast, get ready for city tour of Jaipur. The first visit of the day is to the magnificent Amer Fort. As the fort is located on a hilltop, an elephant ride is offered to the entry gate. It is around 11 km away from the city. Constructed by Raja Man Singh, it is a wonderful amalgam of various huge gates, temple, palaces and other structures. After lunch, explore the other tourist attraction in Jaipur - Jaigarh fort, standing high on one of the peaks of the Aravalis. It has huge battlements on display. Later on, visit Laxmi Narayan temple, City Palace Complex, the astronomical observatory of Jantar Mantar (UNESCO world heritage site) and Hawa Mahal. The evening is scheduled for enjoying cultural performances at Chokhi Dhani village retreat. Breakfast is followed by a road journey to the Mughal City of Agra. On the way, halt at the deserted city of Fatehpur Sikri. It was built in the second half of the 16th century by Mughal Emperor Akbar as his capital, which was soon deserted due to shortage of water. Explore the various structures in this complex, sheer architectural gem including Buland Darwaza, Diwan-i-Am, Diwan-i-Khas and so on. Continue your journey to Agra. Complete the check-in formalities. In the evening, you can visit the local market to get your hands on some delightful handicrafts. Do not miss out on tasting petha, a special sweet, and dal moth, a savory item. Start your day early today. Visit the beautiful World Heritage Site of of Taj Mahal as it shines in the glory of the rising sun. 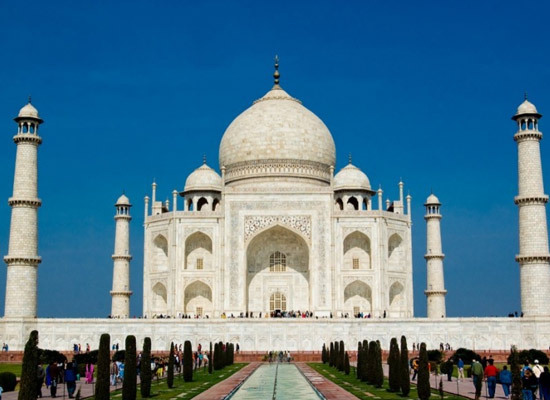 One of the Seven Wonders of the World, this white marble mausoleum was built by Mughal emperor Shah Jahan in memory of his beloved wife, Mumtaz Mahal. 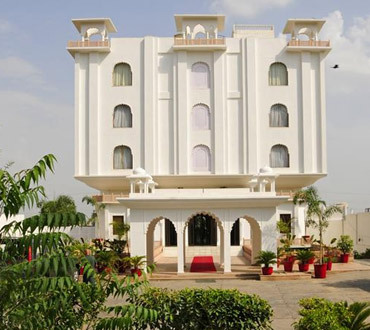 Later on enjoy breakfast, after which you visit the other tourist attractions of Agra. Visit the mighty Agra fort, another UNESCO world heritage site here. The structures in red sandstone were built by Emperor Akbar white the marble ones are by Emperor Shah Jahan. In the evening, you may visit Itmad-ud-Daula's tomb, also known as Baby Taj. Today, get to the railway station to board an early morning train to Jhansi. 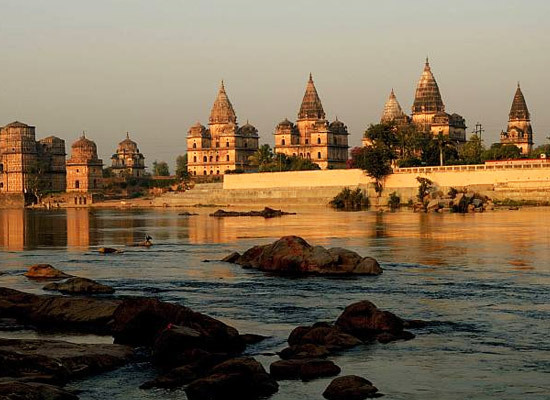 On reaching, embark a road trip to Orchha, Around 18 km away, this medieval town is located in the Bundelkhand region of Madhya Pradesh state. 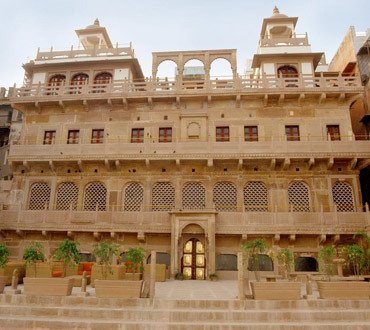 It was established in the 15th century and is quite popular for its palaces and temples. Explore wonderful delights like the Jehangir Mahal- a wonderful Mughal architecture, Raj Mahal and Laxmi Narayan temple for its wonderful mural paintings. Thereafter, start your road journey to Khajuraho, around 172 km away. On reaching, check into the hotel. The day is scheduled for visiting the world heritage site of Khajuraho temples, divided into Eastern and Western group of temples. It is a group of Hindu and Jain temples, which are quite popular for exotic carvings, promoting erotica. These temples were commissioned by the rulers of Chandela dynasty between 10th and 11th century. Some of the popular temples here are Kandariya Mahadev temple, Laxmi & Varha temples, and Devi Jagdambi temple. Thereafter, get an assisted transfer to the airport to board a flight to Varanasi. On arrival, meet your representative who offers you can assisted transfer to the hotel. The evening is at leisure. 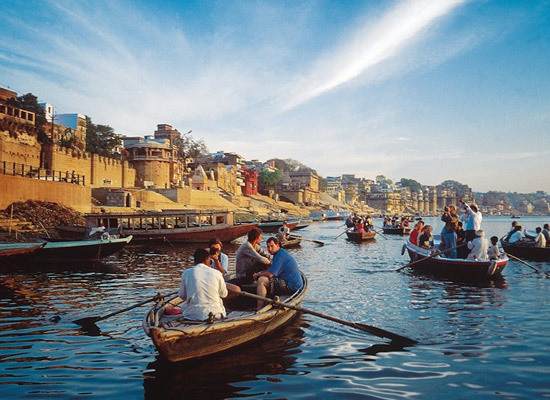 Opt for an early morning boat ride in River Ganga and observe the holy rituals going on at the ghats (banks). Thereafter, enjoy breakfast. Now, you leave for the popular Buddhist Site of Sarnath, which is around 6 km away. Located in the northeast of Varanasi, this is the place with deer park, the site where Lord Buddha delivered his first sermon after attaining enlightenment. This Buddhist town lies on the confluence of River Ganga and River Gomati. Dhamek Stupa, Sarnath Museum and Chaukhandi Stupa are the other attractions that you visit here. Back to Varanasi for sightseeing including Alamgir mosque – a blend of Hindu and Mughal architectures, and ancient Bharat Mata temple. In the evening you can attend the marvelous event of Ganga Aarti at the Dashashwamedh ghat. Post breakfast on day 10, get transferred to the Varanasi Airport for boarding a flight back to Delhi. On reaching, check-in at the hotel. The rest of the day is at leisure. If you want, you can explore the nearby attractions on your own or can indulge in shopping at the popular markets. After breakfast, get transferred to the airport to board a flight for your onward journey.